9833 - MINIKLASSIC Narrow Channel Systems - Jay R. Smith MFG Co.
Used in surface drainage applications where installation depth is restricted. Channels may be assembled in any length utilizing interlocking tongue and groove ends. This reduces installation time and cost, providing an engineered solution to drainage requirements. Four grate variations available: galvanized, stainless steel, ductile iron and gray plastic. 1 meter (3.28') Precast Polyester Concrete Channel of Interlocking Design with a Non-Sloping Radius Bottom Channel and Integral Galv. Steel Rail edge. Supplied with Grate as per Specification. Galv. 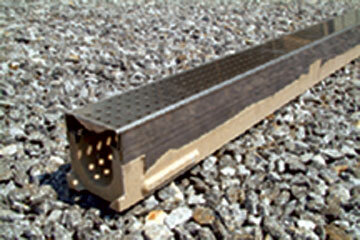 Steel Slotted Grate Load Class "A"
Stainless Steel Slotted Grate Load Class "A"
Galv. Steel Perforated Grate Load Class "A"
Stainless Steel Perforated Grate Load Class "A"
Decorative Plastic Gray Grate Load Class "A"
Ductile Iron ADA Grate Load Class "C"